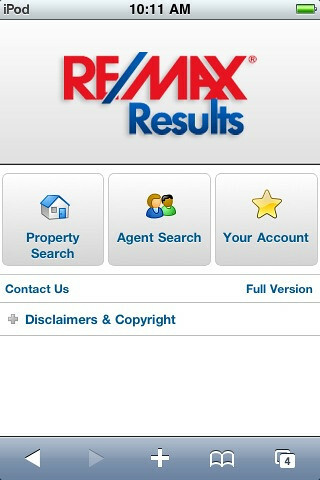 People arriving at RE/MAX Result’s website from a mobile device are automatically redirected to a mobile-optimized version of the site. There are things we can do on a computer’s browser than don’t work as well (or, at all) on a phone, and some things actually work better on a phone than a computer if we optimize each user’s experience to the device they use to access the site. The main three options we present is searching for homes, finding an agent, or accessing their account. Since the mobile site is fully integrated with the main website, we can make the experience seamless from one device to the next. 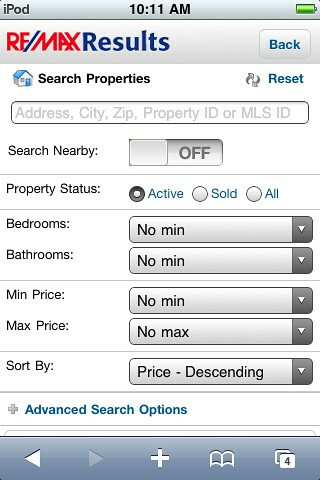 The property search page is the most common choice. From here, a person can choose from common search criteria, location, etc. They could also type in an address of a listing, a city, zip code, etc., to start their search. Additionally, they can take advantage of their phone’s location to search for properties nearby by turning on the “Search Nearby” feature with the flip of a switch. We then ask for permission to use your location for searching. 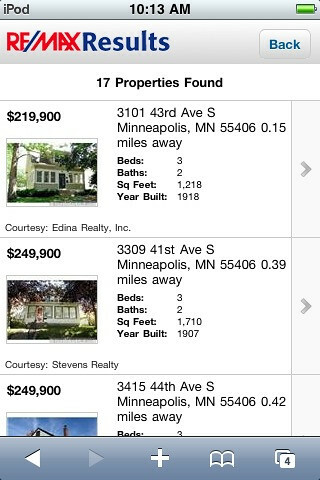 With “Search Nearby” turned on, I ran a search for properties between $200k-$300k nearby. This worked well. As you can see from the “Courtesy:” statements, this site is pulling from the entire local MLS, and not just RE/MAX Results’ listings. 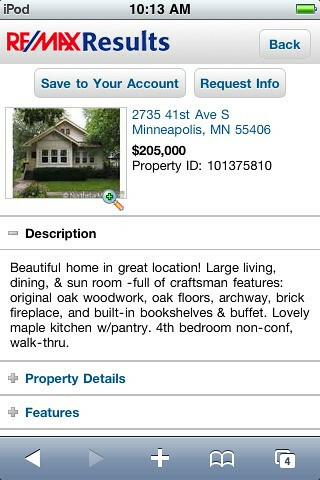 I clicked on one of the listings to learn more about the property. Users can toggle Descriptions, Property Details, Features, and Rooms on/off in order to make efficient use of the limited space. But, more importantly, people want to see photos. By tilting your phone into landscape mode, you can take a tour of the property you’re standing in front of. Find out, on the spot, if it’s a listing worth pursuing further. 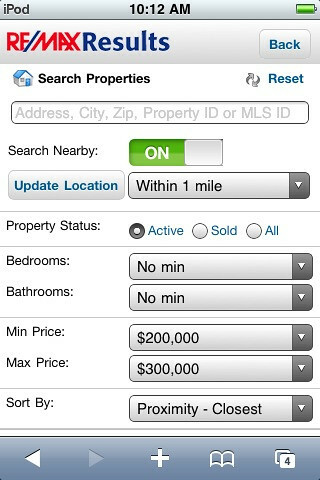 Scrolling down the page, I can see the listing agent, and click to call the agent directly from the page. 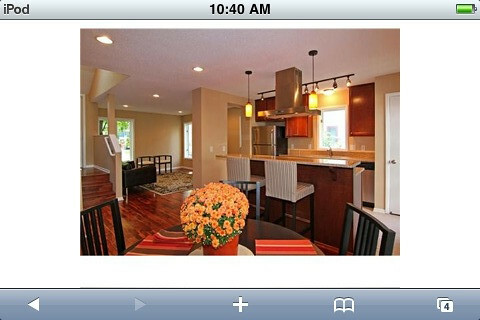 Receiving a call from someone standing in front of one of your listings is as good as it gets. Additionally, interested buyers can email the agent, email the listing to friends, post it to their Facebook account or Tweet it on Twitter. They can also save the listing to their own account for further review when they get back to a computer. Interested buyers can also click to find out more about the listing agent. For example, people may want to know if Mike Kohler has ever done any business before. 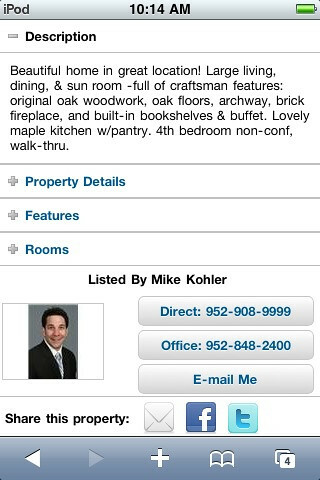 By checking his Solds, or his current inventory, it’s pretty clear that Mike has been in the business for a while, works in the area, and does a great job with his listings. A true professional. That type of vetting should help Mike earn more business through the mobile site. 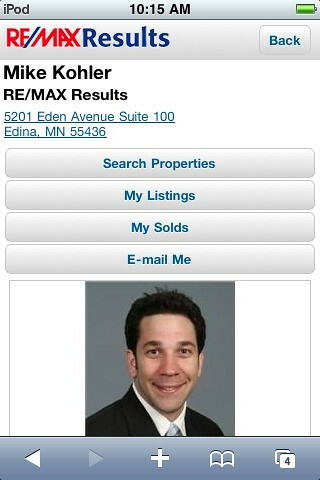 Also, it’s worth pointing out that Mike Kohler automatically gets his own mobile site at http://m.results.net/mike.kohler. 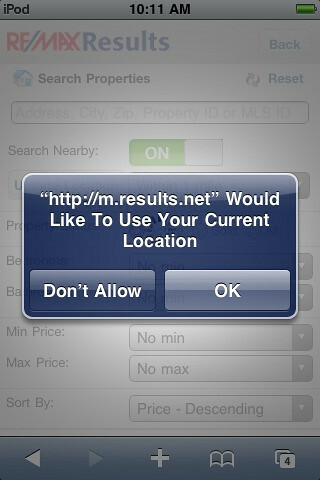 Mike may choose to market that, or purchase a domain to market that redirects people into his mobile site. A lot of thought and work goes into making great real estate sites. We believe that professionally designed, fully integrated mobile sites allow client’s agents make best use of their limited time. Focus on earning, then publishing, quality listings with lots of photos. We’ll make sure that they’re presented well no matter how prospects choose to search for them.